Summer break is over and kids are heading back to school (happy mom dance!). That also means it’s back to busy schedules, homework and packing lunchboxes. If you could use a little lunchbox inspiration this time of year, we have got you covered. Healthy Lunchbox Inspiration. We have 70+ delicious ideas over on poweryourlunchbox.com to help get you out of your lunchbox rut. Need non-sandwich ideas? Got ‘em! Warm recipes for the thermos? Got those too. Nut-free, gluten-free, meat-free? Yes, yes and yes! You’ll be entered to win a kitchen prize pack from Ninja® to make mealtime easier! One lucky winner will receive a Ninja® Cooking System with Auto-iQ™ and Ninja® Intelli-Sense™ Kitchen System with Auto-Spiralizer®. Last, but most importantly, your promise helps families in need. For every person who makes the promise, our incredible partners will make a collective $1 donation to Feeding America® to help families in need struggling with hunger. With 1 in 6 children not knowing where their next meal will come from, we have the opportunity to make a big impact this year. Your promise will help someone else in need. Okay, so you’ve made the promise – what’s next? It’s time to start packing those lunchboxes. We’ve pulled together our most popular tips, round-ups and more to give you all the ammunition you need to tackle this task. We’ll get the not-so-glamorous part of packing lunches out of the way first. Packing food in a safe way is the most important part of packing a lunch. Not sure which foods should stay cold, the best way to keep hot foods hot or what to do with leftovers? Holley Grainger has you covered with these Lunchbox Food Safety Tips. 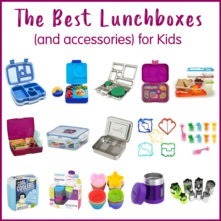 One of the biggest questions we get this time of year is, “What are the best lunchboxes for kids?” The answer is, it all depends on your kid! What types of foods do they like in their lunch? How old are they? Can food touch or do they need a separate compartment for everything? We’ve rounded up our favorite lunchboxes and accessories to help you navigate the many choices out there. Trust me, when you plan ahead you avoid the headache of having to throw together a lunchbox in 5 minutes before running out the door to catch the bus. I promise it’s not as hard as it sounds either. I love this Lunchbox Basics: Set Yourself up for Success post from Brenda of Meal Planning Magic, full of simple ways to keep things organized. Plus, grab her Top 10 Meal Planning Tips for Back to School (or returning to school after the holidays) to get yourself on track. 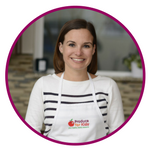 And if you’re packing lunches for everyone in the family, yourself included, check out our registered dietitian’s tips for packing healthy, tasty lunches for the whole family. While the thought of having your kids in the kitchen might stress you out, they’ll be much more likely to eat their lunch at school if they help make it. Print out this Build Your Own Healthy Lunchbox or Build a Better Sandwich guide to help kids plan what they’re going to pack. Don’t forget to pack that lunchbox full of fruits and veggies! Here’s are 10 ways to add more to your child’s lunchbox. There is a hack for just about everything, and packing lunchboxes is no exception. We rounded up 20 of the top lunchbox-packing tips from fellow parents. Have a hack that’s not on the list? Comment on the post and let us know! Let’s get one thing straight. There’s nothing wrong with a “boring” lunch. It’s important for your child to eat something that’s well balanced to fuel them through their day. I have one very picky child who won’t eat very many things. But I do know that if I cut her sandwich into a fun shape, she’ll eat it. Or that if I serve baby carrots with a little hummus (and definitely not ranch) to dip them in, she’ll eat them. There are really simple ways to turn food into fun for kids. Maybe it’s cutting it into a fun shape, serving with a dip or adding a few mini chocolate chips. Find what works for your schedule and kids. What You’re Really Looking For – Lunchbox Ideas! Did we miss anything? Do you have questions about packing lunchboxes? Comment below and let us know! It’s a great article. It’s more useful and informative. I like it. Thanks for sharing. Wow! What an incredibly helpful article for parents who may be struggling with lunches! 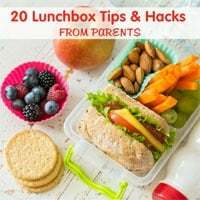 I have written a few posts on how to pack healthy lunchboxes and even I found a few helpful tips. ?